On December 7 we celebrated Sinterklaas with Wilma and Fred. Usually, I start preparing and crafting for this about a year in advance. But this year, I just didn't get around to that. I only made the simplest 'surprise' (that's what we call something crafted that is used as special giftwrapping) ever; an arm for Fred, who had asked for storage for all his watches (his latest obsession). 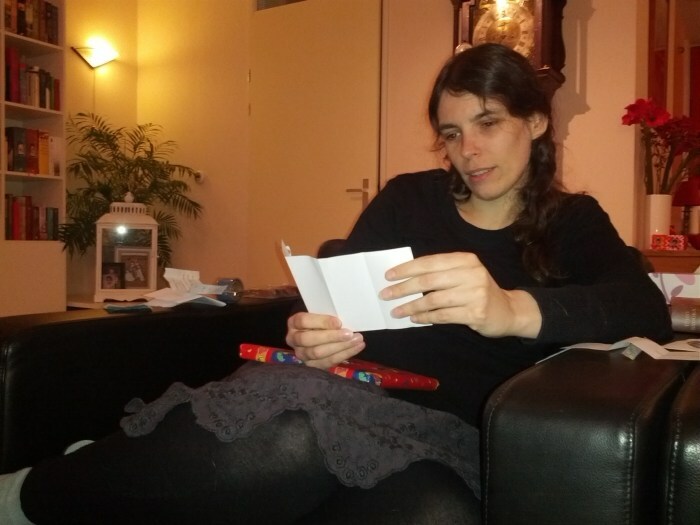 Mala understood very well that this was a present for her and paid attention to the poem Fred read her. Luka preferred to read herself. One of the presents we received was an advent calendar made by Wilma out of decorated paper baggies with small presents for both of us in each bag. We got to open one each day leading up to christmas. In them we found things like socks, Liquorice, small scrapbooksupplies, a doctor who diary, a little decorative snowman, chocolate, giftcards, cute band-aids, and other tidbits. Fun! I used the bags as christmasdecoration als will be using all of them in our photo-album for december.